Victory Child Care, Inc. is proud to announce a new partnership with the Guilderland Central School District! We provide programs for pre-schoolers (children who are 3 years-old) and pre-kindergarteners (children who are 4 years-old) at two locations – Pine Bush Elementary School and Farnsworth Middle School. This program is a full day, year round program, including summers. If there is a need, we can offer an option for a part-day program - please indicate your level of need on your application in the "Additional Comments" section. Children who are 3, or close to 3 (2 years 9 months), and up, may enroll. While the program is open to anyone, priority is given to Guilderland residents. Enrollment is on a first come, first serve basis. Tours are offered, by appointment, at all three of our locations. Come to one, or visit all of our sites, to see our high quality, learning program! Victory Child Care, Inc. works closely with district leadership to provide high quality educational services across all classrooms. We utilize the New York State Pre-kindergarten Foundation for the Common Core, Early Learning Guidelines and Core Body of Knowledge to guide our instruction. We monitor our instruction by evaluating classrooms using the Early Childhood Environment Rating Scale and the Pre-K Classroom Assessment Scoring System. There’s nothing quite like the mind of a child. We inspire children as learners and cultivate a love of learning. We encourage children to be creative, confident thinkers. Rather than give children answers, we help children to construct their own theories, make predictions and test those theories. We encourage children, through process, to discover for themselves. We promote children’s learning through observation, discovery, exploration and representation. Through studies children connect experiences and use important process skills. By exposing children to knowledge, we help them to make connections and construct their world. We intentionally engage children in meaningful conversations about their experiences and ideas and encourage communication between peers. Each child is recognized as having a contribution to make to the classroom community and learning experiences. Teachers support social/emotional health of children and build strong classroom communities with the Kindness Curriculum. Teachers guide children to recognize their feelings and build empathy towards others feelings. Teachers help children understand respect, self-control, friendship, and conflict resolution. Teachers also focus on art, music, and drama activities by integrating them into daily classroom experiences and activity time opportunities. Children participate in process art, which supports exploration and creativity. They study famous artists and their particular styles and techniques. They are exposed to many diverse music styles and genres. They are encouraged to participate in music through movement and singing along. Drama activities include puppet shows, putting on classroom and center wide plays. Teachers encourage growth of healthy children through our Get Fit Curriculum. This curriculum supports healthy lifestyles, including developing physical skills and healthy eating habits, through intentional teaching. Research shows that there is a correlation between academic achievement and children who participate in dance programs. We are excited to provide a quality dance program, as an enhancement to our curriculum to our families that enroll. The cost for this program is covered by tuition. 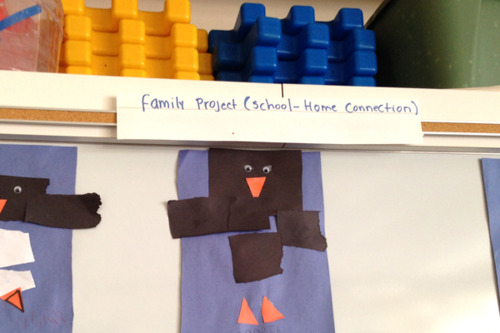 Teachers support home/school connection by having monthly events that support families. Families are encouraged to participate in classroom events, many of which occur after school hours, and to complete projects at home that support classroom curriculum. Teachers are mindful of the classroom learning centers, ensuring that they are interesting, challenging and supportive of curriculum. Children can engage in the learning centers of their choice, work independently, or engage in cooperative projects. Most importantly the learning centers must encourage play and exploration and challenge children’s thinking. We now know that brain development is critical until children are five. For pathways to become developed children need to be immersed in a rich environment that engages children and stimulates learning. Children thrive with a sense of rhythm to their day. The structure of a child’s day is purposeful, yet predictable, so that children can feel secure, learn and grow. The structure must also be flexible so that children’s interests and temperaments can guide their daily adventures. The structure provides opportunity for children to work independently, in small groups, or as a classroom community. A child’s typical day includes Breakfast, Morning Meeting/Friendship Circle, Morning Exploration, Outdoor Play (Indoor Play in inclement weather), Literacy Circle, Story Time, Lunch, Nap, Afternoon Snack, Afternoon Activity/Friendship Circle, Afternoon Exploration, Outdoor Play, Story Time and Afternoon Exploration. Teachers introduce learning with children’s literature. Reading and Writing, as well as Math opportunities, as a part of every circle time. Morning and Afternoon Exploration Teachers prepare independent materials that support children’s learning in Literacy, Math, Science Exploration and Social Studies concepts. Children have choice of activities that supports individual and group learning. Teachers prepare Literacy based materials that move children on the continuum of learning and ready children for Kindergarten. Teachers continue their work with classroom learning centers, as children continue their development, with an emphasis on Kindergarten Readiness. To ready children for kindergarten, teachers provide emphasis in Literacy, Math, Science and Social Studies.